Progress of our VW CC project has slowed down a bit. With the release of Audi and VW’s “MQB” chassis on the new models, and the tuning capabilities already available from APR, we question if it’s worth continuing with this project or moving on to a new one. We’ve been going back and forth for a few months and still haven’t decided what to do. 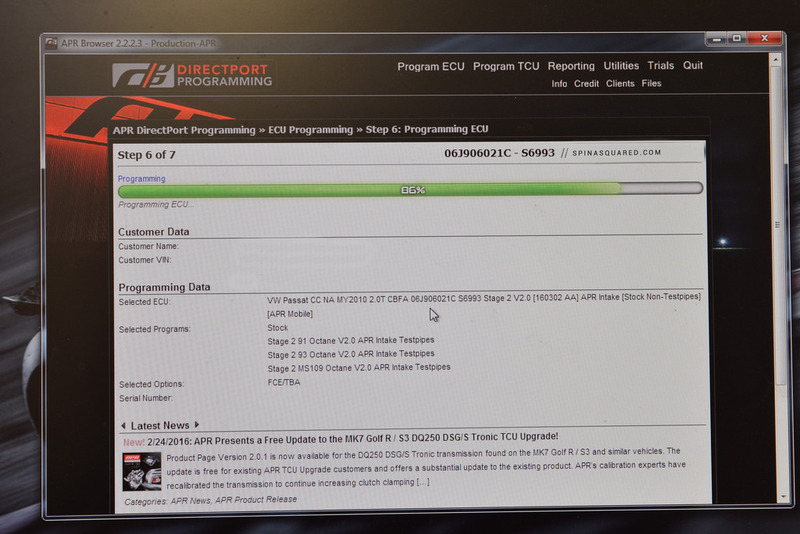 Then APR reached out through Achtuning and asked if there was interest in testing their beta software which included some updates and enhancements to the already available ECU (engine control unit) and TCU (transmission control unit) upgrades we have installed. The CC was immediately plugged into the APR server and the software was updated. The new file wasn’t completely issue-free but after providing some feedback and data-logging using the APR Mobile app, APR released their “v2.0” update a week later. The new power figures quoted by APR are up considerably, a 77 horsepower and 102 ft/lbs of torque increase over stock! What was once “250HP/294TQ” on our VW CC (we actually dyno’d it locally and saw 242HP/282TQ) is now “270HP/319TQ”! The difference is noticeable and combined with the new TCU tune the car feels new again! The crew at Achtuning kept the engine parts in check to make sure any issues were not related to APR’s new software and found our CC needed an updated PCV “air/oil separator”, a part known to fail on these “EA888 Gen 1 2.0T” engines. New spark plugs and ignition coils were also preemptively swapped in. The original engine/transmission mounts were also showing their age so when Achtuning received a stocking order of “Street Density” mounts from 034 Motorsport we had those installed, too. The mounts look very similar to the OEM parts they replace, hardly noticeable as an “upgrade” but they stabilize the engine which directly translates to reduced drivetrain slop, decreased engine movement under load, and direct power transfer to the wheels. Past experience has shown that upgraded engine mounts typically contribute to in-cabin noise and vibration but the “60 durometer” rubber offers just enough engine stability without adding much “NVH” (Noise/Vibration/Harshness) inside the car. So far, it looks like we’ll be keeping the CC a little while longer.